Cyndy Lemmon of Christiansted, St. Croix, had just opened her front door when her young miniature Pinscher, Kiwi, bolted into the yard where Cyndy’s fiancé, Joe Southwick, was repairing fencing that had been damaged during the hurricane. Kiwi took off, leaving Cyndy heartbroken and fearful for her small dog. “The gate wasn’t up yet, and Kiwi zipped out,” said Cyndy, who posted a lost dog notice on her veterinarian's bulletin board following the incident. 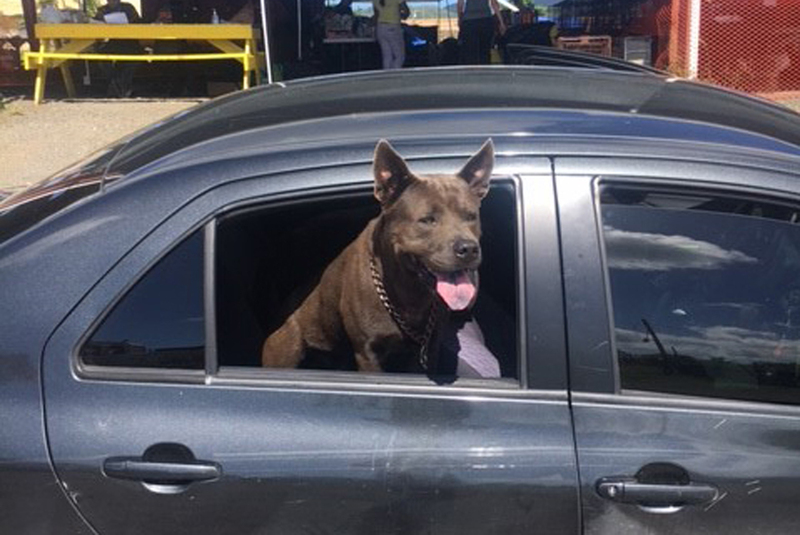 Meanwhile, a Good Samaritan named Scott Hiddleston had found Kiwi and posted her photos on a Facebook page for lost pets, explaining he had taken her to the ASPCA’s emergency shelter on the grounds of the St. Croix Animal Welfare Center (SCAWC), which was heavily damaged during the storm. Two days later, someone recognized Kiwi’s photos and tagged Cyndy. 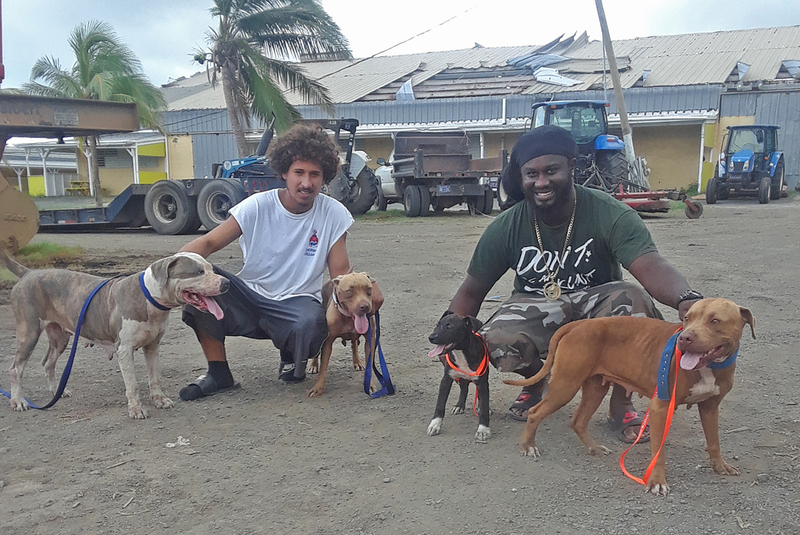 Frederiksted resident David Brewster, whose home was damaged, sheltered his four dogs at an abandoned elementary school while he was at work. A concerned resident reported the dogs to the ASPCA, unaware of the fact that they were being housed at the school intentionally. The dogs—Versace, Sheba, Eve and Shishi—were then taken to our emergency shelter, where David was able to identify them on November 16. 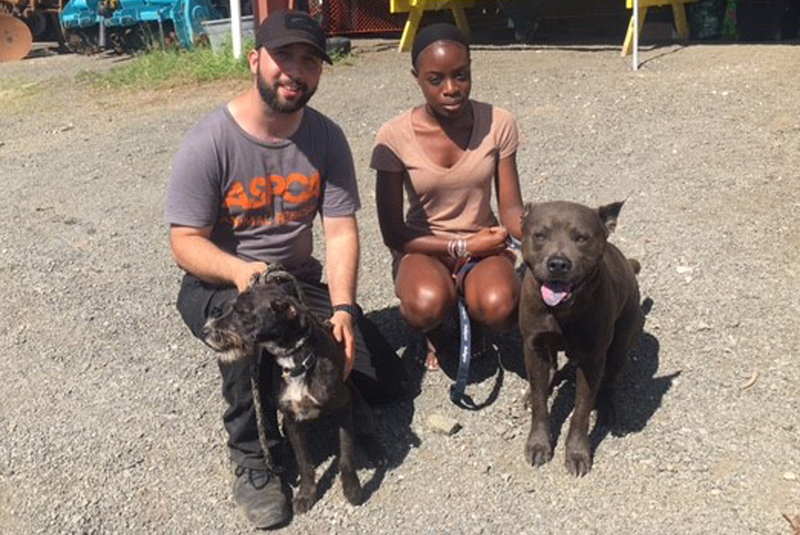 “They were so happy to see one another,” said Pamela Holmes, an ASPCA responder who facilitated the reunion. She also provided David with supplies, including dog crates, collars and leashes to further help David and the dogs in their time of need. Brutus on his way home, after being reunited with Robyn. 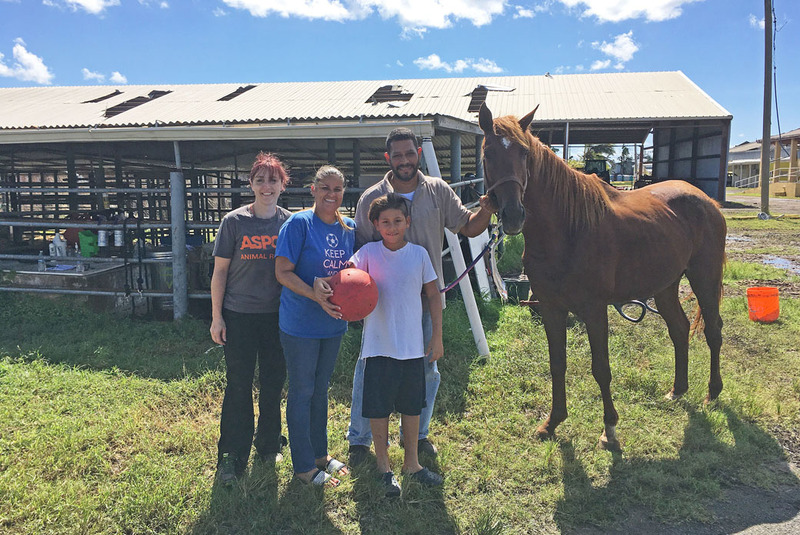 Chester, one of many horses who was displaced after the storm and rescued by ASPCA responders, also experienced a happy reunion. “One day when I was cleaning the horse stalls, a woman excitedly appeared, exclaiming, ‘That's our horse! I can't believe he's here!’” recalled ASPCA Senior Vice President of Information Technology, Nada O’Neal, who was in St. Croix assisting the field response team in caring for the displaced animals. Nada was cautious at first, but when the woman, Vanessa Abed and her husband Anuar, showed her pictures of Chester being adored by family—even munching on cool ice cubes on hot summer days—it was clear that Chester was a beloved family member. 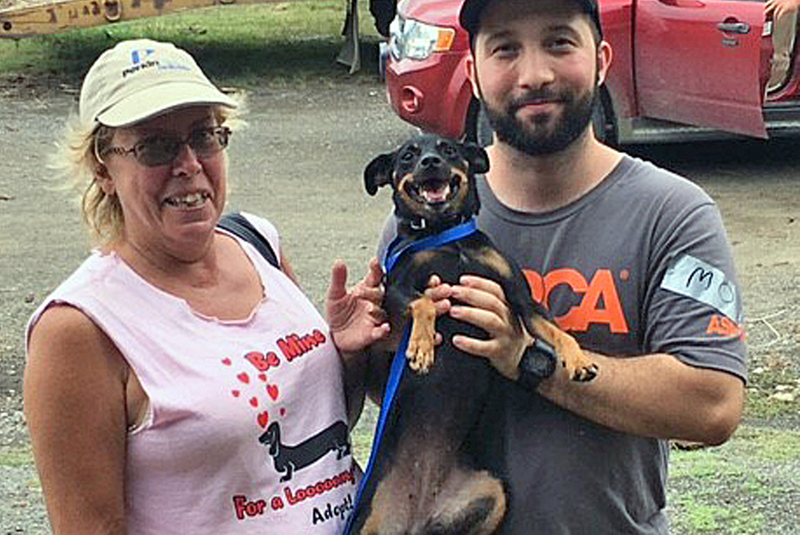 Since September 28, more than 400 animals have been cared for at the ASPCA emergency shelter, and over 13,000 animals impacted by Hurricane Maria have been assisted by the ASPCA through the distribution of pet supplies. Joel Lopez, Director of Planning and Field Operations for the ASCPA’s Field Investigations and Response team (FIR), spent over three weeks in St. Croix. He also coordinated our response to Hurricanes Irma and Harvey, as well, ensuring that the right resources got to the right place at the right time. But Maria posed special challenges. In addition, according to Joe Hinkle, Shelter Director for the FIR team, many places still lacked power, including the temporary shelter. Some retailers accept cash only, which makes shopping for resources difficult, and internet connections are iffy when they were available. The ASPCA has deployed more than 300 responders this year alone to assist communities impacted by hurricanes and wildfires throughout the U.S. and the Virgin Islands. We are currently committed to remaining on St. Croix, working under the direction of the Virgin Islands Department of Agriculture, until January 1, 2018. The SCAWC, which has been serving the St. Croix since 1973, continues to work closely with the ASPCA to serve the community’s animals and begin the process of rebuilding. “We’ve never been needed more to help reunite displaced pets with their owners, as well as care for the many strays we have due to overpopulation and those that are being left behind as some families are forced to leave,” stated Laura Ballard, SCAWC Board President. Luckily for some animals, being reunited with their families is the first step to rebuilding what was lost. We are grateful to be able to make these difficult times slightly easier for those who have suffered so much.